Ever observed your cat drinking water and wondered why he drinks in such a strange way? Discover the scientific reasons, plus how much water your cat needs. Every cat parent knows one thing for sure about their cats: they are as mysterious as they are fascinating. And one of the weirdest things to observe is a cat drinking water. If you’ve ever wondered how your cat is able to drink water with such precision, you’re in good company. Scientists from one of the most acclaimed schools in the world wondered about that, too! So how, exactly, does your cat drink water? A ginger cat drinks water out of a small bowl. Photography by Shutterstock. According to MIT News, one of the first close observations of a cat drinking water was made in 1940. 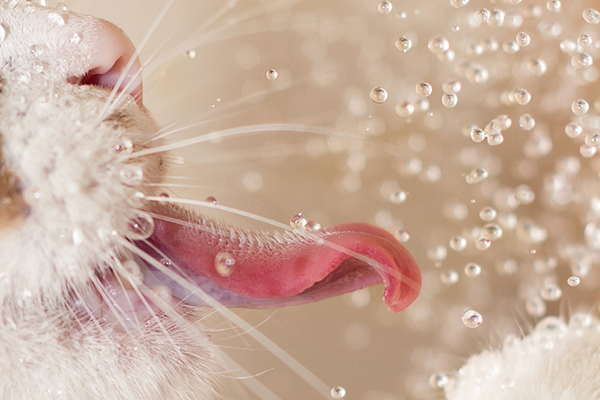 An electrical engineering professor used stop-action photography to capture how the cat’s tongue was making contact with the liquid. He observed that cats fold their tongues down and inwards so that they touch the water’s surface with the tops of their tongues. Fast forward a few decades and scientists are still curious about cats drinking water. Only this time they used more advanced equipment to study their kitty subjects. 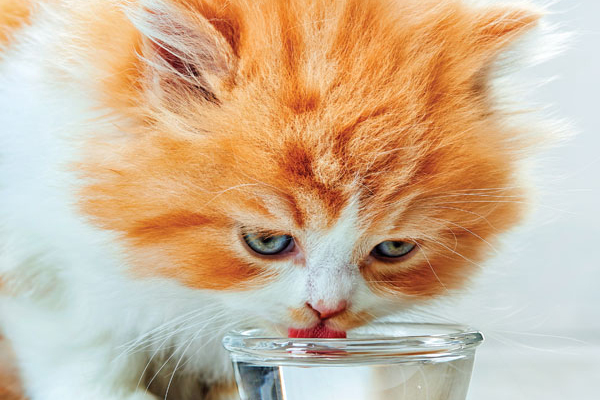 MIT’s Roman Stocker was curious about the way his cat was drinking. So, he filmed his cat drinking and slowed it down. He was surprised by the biomechanics of how his cat was overcoming gravity to get the liquid into his mouth. He found that the top of the cat’s tongue is the only thing that makes contact with the liquid. Stocker and his colleague, Pedro Reis, further studied what was happening. Cats make a capital “J” with their tongues, touch the top of the liquid and pull it back to their mouths. This creates a column of liquid going up towards their mouth. They then close their mouths at the right time to drink before gravity thwarts their efforts. Everything about the way your cat drinks is maximizing his ability to consume liquid efficiently. Since cats aren’t necessarily going to cooperate with their studies, the scientists were able to find out precisely how the mechanics of how your cat drinks by making a physical model. By using glass disks to recreate a cat’s tongue, they were able to further determine a mathematical equation that compared lapping frequency with the feline mass. Essentially, their findings conclude that larger cats lapped more slowly. So, how much should your cat drink daily? According to PetMD, a 10-pound neutered cat eating 502 calories per day from dry food requires about a cup of water per day. That same cat on a diet of wet food should drink about 1/3 cup of water per day. As cat parents, it’s important to determine if your cat is getting enough water. 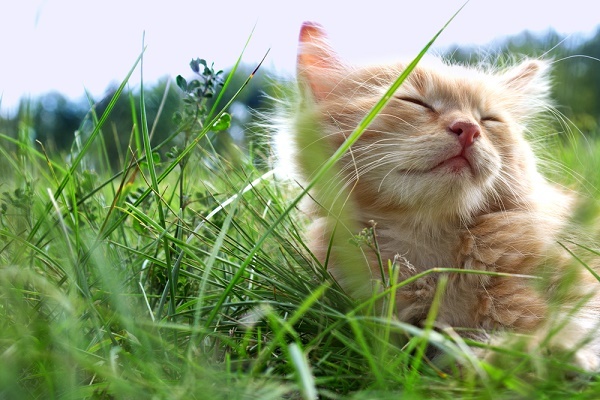 Skin elasticity, coat conditions and energy levels are good indicators. Not getting enough water can also result in dangerous medical conditions like urinary crystal formations. Cats hide their pain, so one of the surest indicators that something is physically wrong is an uptick in their water consumption. While it’s hard to say exactly how much water is too much water for each cat, if your kitty is making more trips to the water bowl than usual or seeking out water from sources usually left untapped, a trip to the vet is needed. Vetinfo.com says a cat drinking too much water could point to kidney issues, amyloidosis (a problem in metabolizing protein), diabetes mellitus or hyperthyroidism. Paying attention to how much water your cat is drinking will alert you to the state of his health and well-being. Too much water might mean there’s a serious problem. Too little water can put your cat at-risk for medical complications. Plus, paying attention to how your cat is drinking water is also quite revealing. The way your cat drinks water is another example of the modern marvel your cat has evolved over time to become. He’s not just a stealthy hunter, he’s a stealthy drinker, too! Thumbnail: Photography ©Oranit6666 | Thinkstock. For some reason, both of my cats will only drink from a large plastic watering can. I can tell when the water is getting low because I can hear them on the plastic. I put clean water in it but the container is not clean. I know I should still put out a bowl of water for them but it always goes untouched. e also loves to drink water from faucet. My cat drinks with his paw! He dips his paw into the water, and then licks the water he soaked up from the bowl… I can always tell when he’s been at it because his one paw is wet and he leaves a little wet trail from his drinking paw! My cat does this…she loves to sneak up on people’s drinks and get a taste of what they have in their cup…..I have to make sure to be on the lookout when friends are over! One of my cats has the need to drag the water bowl before she drinks. I keep 2 very large water bowls available. I’ve had to place them on absorbent drying mats to keep my floor dry. I don’t know why she does this, but I wonder if it’s so she can see the water. She should just do what the other cats do and touch it with her paw. Cats are weird. I have 4 cats. One of my cats REALLY drinks water weird. He dips his hands in the water bowl, then drinks from his hands! I don’t know why. His brother doesn’t do that. His sister doesn’t do that. His mom doesn’t do that. Just Tiger does it! Both my two cats like to drink from cups. So aside from their regular water dish on their “dining table”, they expect us to keep a cup of water in the kitchen and both bathrooms— but weirdly, they won’t drink from faucets. And one of them will sometimes “paddle” one paw along the outside of his water dish while drinking, as if he’s trying to go fishing or swimming, lol. My kitty has an even stranger way to drink…nanoo nanoo, he drinks with his paw. And he is a southpaw to boot. He always dips his paw into the dish and then grooms the water from his paw. By the way, he then brings me to paw to dry it off. He is too cute! My 5 yr. old part Siamese cat likes to drink water from the tap (spigot). when the water is running from the faucet.